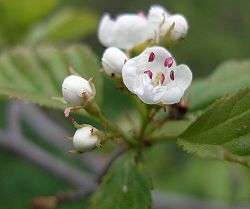 The White Hawthorn blossom (Crataegus mollis) was named the state flower of Missouri on March 16, 1923. There are approximately 100 different varieties of hawthorn. It is a member of the rose family, closely related to the apple. The Hawthorn tree is small with flat, thorny branches and white blossoms.